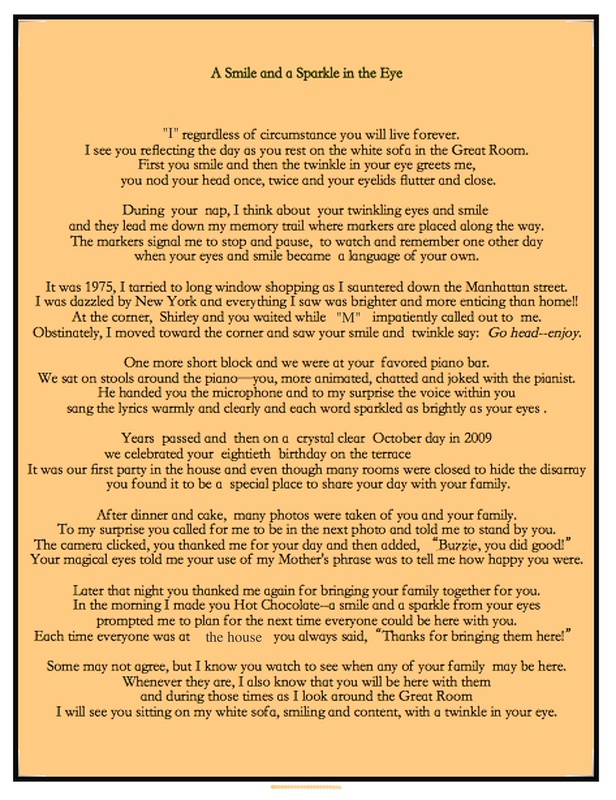 In July of 2008, I wrote a good-bye letter to my sister-in-law Rhoda. She was in hospice and died of pancreatic cancer within a day or two. A link to my letter to her is: Dear Rhoda. You will read in the preamble that she had one daughter and a granddaughter left behind that she felt responsible for their welfare. I don’t remember the first time I met her daughter Ruth, but it was in Montreal where she lived with her parents. In a short time her parents were divorced and Rhoda moved with her to Florida. By the time M and I moved to Florida a whole lot of “not so pleasant history” had been created. Ruth and I saw each other a lot in Florida and I realized she was very smart, wickedly funny and self centered. Many of her problems started when she was a small girl in Montreal where I believe she made up her mind that her Mother owed her for her misfortunes. Her health was always precarious simply because she refused to follow a suggested diet plan to control the Crohn’s. She always preferred eating hot dogs, donut, spicy food and deep fried food that aggravated the Chrohns. Eventually she had a total exoneration and afterward gave little thought that it was time to make some changes. About two years ago, Ruth developed pancreatic cancer. At that time, she could have had surgery so that she could live. She refused surgery and never wanted to acknowledge that she had a cancer that would kill her. Two days before she died she told M she was going home and that once she was there she would be fine. Ruth died and it is sad to say that we are not sure if there was any type of burial. It is even sadder that she wasted her life so successfully. Ruth’s daughter, Sara, was a manic depressive. She, like her mother was bright. Sara tried to make something of her life, but it was too difficult. The last years she lived with Pete who was at least 2-3 times her age. I never met him, but photos show him old and grizzly. Pete smoked endlessly and found he had fully developed lung cancer. He never told Sara he had cancer, but promised her that he would make sure she always had their condo to live in. Pete died. Sara was alone, depressed and sad to have lost Pete. She wrote sad love poems to him and posted them on Facebook. Pete was the only person she ever had that she could depend upon. Her mourning never lessened and one day, her father let himself into her condo and found her slumped over her computer. We are sure she took something to stop the paint. I could write more. I won’t. It is so unusual that within a few short years three related people died, two Mothers, one a grandmother and a daughter that was also a grandchild. We often speak about this trilogy of death. We understand the why’s of each person yet it leaves us with an odd feeling when you know nothing could ever have changed the destiny of this family. In June of 2013 I wrote a blog about my brother-in-law Hy who had Alzheimer’s and was staying with us at that time, (If you wish to read the blog entry use the following link: tp://wp.me/p13BTS-xh. His life was in an upheaval; not liking where he was living in assisted living, he called me to come and get him and that he no longer wanted to live in a place he didn’t like. The days while he was with us passed quickly. Each morning I arose very early to find Hy somewhere near his room. Each time I motioned for him to join me in the kitchen. After making coffee and preparing something for breakfast (pancakes were high on his list of likes!) he and I sat together chatting. Often he would tell me tales of his family based on youthful or adult memories. Almost always, a twinkle formed in his eye as his yarn unfolded and even when I knew the story was slightly different it didn’t matter because the twinkle made me smile. Not often did we discuss his disease, although at times he acknowledged and shared his worries about having Alzheimer’s. At the early breakfast table chats I was heavy, as I am now. With a little prodding and a joke from him I tried to explain my eating patterns. He was adamant that I needed to change and in the meantime he nicknamed me “Big Boy”, a name that he always remembered. Regardless of the conversation, soon we would break into singing old songs which seemed to bring the chat all together so that we each had an enjoyable time. After his stay with us, he moved to a very nice apartment in another assisted living apartment building. After a year and a couple of months of enjoying his new home, his condition quickly changed and Hy passed away following a stroke. The change began when he sustained a head injury a few weeks before. The emergency room nurse told us nothing serious was found and that he was going home that same day. During the next two to three weeks Hy continued to deteriorate until the day he had the stroke. He was in the hospital a very short time and discharged to his home with hospice. M and I saw him two times after he returned from the hospital. He laid in a small hospital bed in the corner of his bedroom. A hospice nurse sat in the opposite corner watching him and waiting to see any changes and to give him the regimented dose of morphine. This first day, even though medicated and unable to speak he was able to let us know he knew us. Once he tried to speak. I could tell he was asking me about something. Finally I realized he was asking what was wrong with him. I simply told him he had a stroke which his left side paralyzed. He understood and began to hit the bad leg. It was clear his was upset and sad at the grave change in his health. I think he knew that his living was over. We told him good-bye and that we would see him the following day. We left disturbed because he received only tiny dose of Morphine, an amount that couldn’t even be labeled as a palliative dose. We feared that with a minimal dose he would linger too long in this state and suffer each hour. The next day’s visit was different. The morphine dose was at an acceptable level. We could tell that he would not last more than another day. We bid our separate good byes to him and silently left with thoughts of him and his life running through our heads. The next morning he died around 11:30 a.m.
Death is not joyful, but at times death is better for the person. He never wished to linger for death to arrive on some unknown future date and be tormented by a ravaged mind that could not understand it all. Now it is over and the living must deal with his passing. Since we moved to Florida five years ago I have enjoyed having him at our house for small dinners and larger parties. Years ago when M and I had a dinner party I realized there were two tables of guests that needed attention. I took one of them to sit at and then put Hy and his wife at the other to make sure those guests were happy. They were amazing at table talk and the guests enjoyed the attention they gave to them. In Florida Hy became even more jovial and fun. As his mind deteriorated Hy continued to enjoy life and be concerned about the people he knew. So many times he called to find out how I was during the time that I had surgery, broken ribs, chemo, and a host of continuing problems. 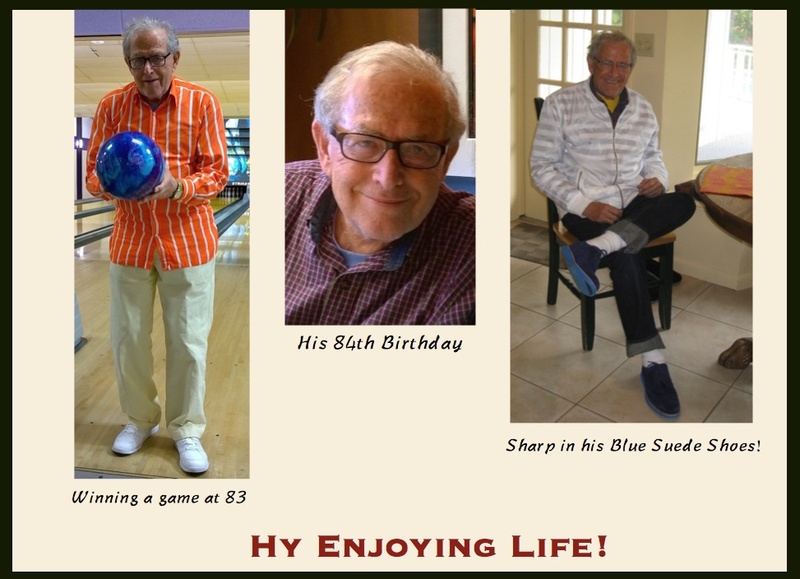 Yes, I shall miss him and continue to believe that to have been with Hy was to enjoy Life at the fullest. Understanding that makes saying good-bye easier. Perched upon the white, undulating rail, a snow-white dove coo‘s at me from its beak of gold. As it extends its wings for flight, the feathers change from stark white to a glistening gold. Suddenly, I remembered how often this dove was in my life during the last weeks of Momma’s life. I wrote poems, used the phrase “on the golden wings of dove” in my blog entries and even sat next to her carefully describing the wonderment of this dove. 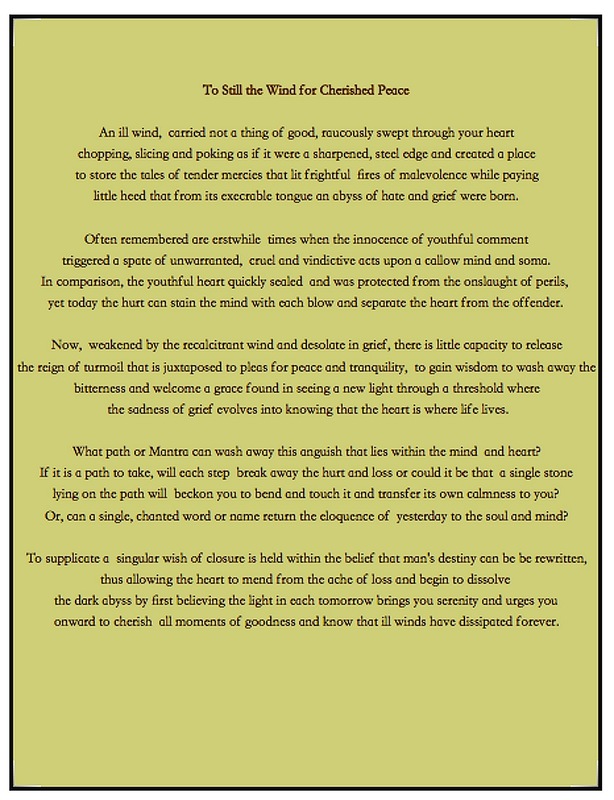 Until I started writing, the connections to Momma, her death and how I used the story of a golden dove, was certainly not clear. By the time I wrote “Perched upon the white, undulating rail, a snow-white dove coo’s at me from its beak of gold,” the past was also perched upon the rail. Think of it, though, within the context of my fantasies, to ride upon their golden wings, particularly if they carry me through a galaxy of brilliant stars, can only be seen as a mighty, rejuvenating experience for me and as I awaken the good feelings of fantasy will keep me going for a long time. Each time I write about the intangible I question if there are those who don’t understand the uniqueness of fantasy. I wish they could! !, but then I remember there are all the rest of humankind that does understand just how important a few moments away from reality can bring you back filled with cheer! Many, many years have passed in my life. Much of my behavior, my ways of dealing with life have stayed the same and I never believe a person can change his existing behavior. It is because of my belief, at sixty-five I question if the ball in the game I play can ever change to a better court? Unfortunately, we form at an early age without an opportunity to decide our own basic building blocks nor are we able to question or control our progress. Each night I vow that tomorrow offers another chance. I list all my uncontrollable actions and face them truthfully. I certainly am not stupid. I know that every glob of food I eat, that is not part of pure sustenance, allows me to gain another pound. Each year since 1995 I have lost the struggle for thinness . Each year the scale goes up and then it goes down, yet over that period of years I still go up and up. Pre-1995 was a period of awakening to everything. It seemed easier to hold my weight within a very small window of change. My bingeing, once controlled to some degree, now stalks me every hour of the day and many hours in the night. I feel me. I know what is going on inside and outside of me. I understand good, the bad and now the ugly that has rolled in!! My vows at night do little good. By the time I get up a few hours later I forget there ever was a vow to control me. It is just after this time that I am aware of what little control I have over myself. I realize the wanting, vowing, and failing periods cycle continually and “eat” up whatever psychological energy I may have left. To let me take my journey without thought will only lead me to a disaster from which I can not return. I understand fully what “disaster” may mean. I understand, yet continue on as I am. It is to clear that the ball will never ever change courts for me. Not long ago my brother-in-law died. Death can not be escaped, but for him it should have been different. When a brain tumor came back to haunt him, the family decided that he should be treated by laser surgery, rather than use normal surgical methods. Surgeons, the family doctor and my spouse saw the laser to bring post surgical problems and we all pleaded to go with the surgeon they had used before. Soon after surgery the problems began. A laser is no different than chemo or other radiation. It effects and success are not seen right away and while performing the surgery more tissue may be killed that surrounded the tumor. Eventually the problems began as his condition deteriorated.. The nursing home (rehab center) he was sent to didn’t begin any kind of therapy for a very long time and good medical care didn’t happen. Everyday it was sad to hear about the last disagreement between family members, particularly in deciding what and who should take care of him and insure that proper care was administered. Days passed, arguments heightened, care never escalated in the nursing home and he began retaining fluid at a high rate The fluids leaked outside of his body. Some degree of medicine was given to him, but not enough to ready him for a trip to another state and on an airline. The day arrived with each step arduously taken as he needed to move from here to there, step up, step down, move here and then know there is even more steps before it all stops. At the destination, he needed to repeat all the moves again until he could be in the comfort of a bed. Finally, he was at the place where he could rest and be loved. Peace came to him during the early morning hours. Bitterness, accusations, hate, sorrow, hysteria bloomed that morning for his family. When I was told of his passing I though it to be a very distasteful joke. I thought this couldn’t be true, how could this happen to him after all he had been through. In the bitterness felt in the family everyone blamed each other for his death, but blame does no good. He has gone away, gone far away and the only way to be with him is through the grace of finding peace and serenity and to understand that life lives in the heart forever. I shall always remember him. I shall continue to help the family understand their greif and that it has many steps that can not be escaped. You will experience each one regardless of the depth of your relationship and you will miss that person. Grief is nasty, grief never really stops. I know. I have been there and walked that path. I still walk it today. I am home again. From the moment I walked through the door I knew that I should have never left. I needed to be here to be close to my memories and to be able to come to a new intersection in my life. I wonder when that may be. I feel stuck between the stages of grief that are on this journey of mine that seems long and for now I do not know where the end shall be. That lingers on your smooth, soft cheek in my memory. to take you down the porch stairs and disappear within the blackness of the night. I see your little face tipped to the right, your white soft curls frame your face. It is again the anniversary of that time, the time the Angel came to take you on your way. I see you and remember you everywhere I go, but mostly I see you at home. Here, your smile, your little hand, the memory of the yellow dress you wore are here with me. they are my sentinels guarding the place and memory of your last moment. I know if I linger too long the moment will cut like a dagger into my heart. when suddenly I stop and pick up the little package holding the curls of your hair. and I need not fear the moment will stab my heart to tears, for now you will let me smile. So many days (weeks) have passed since I have posted. I have tried to write, especially at night, I sat in the darkened room at the little desk. As always, my Mother’s life support motors continued to whoosh and play in synchro-nized tones as I sat in the dark. The computer screen dimmed to maximum so the darkness wrapped around and cradled me. Even as I sat in this well-known spot, the words rarely came. Instead, a stream of empty-headed babble floated in and around my head and quickly I began to feel very exhausted which then lead me to give up and go to bed. One more night wasted. Not only did I not write, but also the time sitting uselessly in the chair robbed me of the time I should be sleeping. It felt like a vicious cycle as the wasted hours accumulated and the body’s exhaustion peaked at new levels that take forever to lower. I admit I am sleep deprived and it does take rest for the mind to function. The body is a funny thing and shows you what needs to be done as it takes charge when I attempted to type. Without realizing it, I fell fast asleep. When I awakened only a moment later, I noticed that I needed to delete the letters and characters I had rested my fingers on as the body shut down for the moment. The lack of sleep may make me continually disagreeable and it may cause my body to eat more than it should, but it is not the only cause for my lack of words. Lack of words, the blank mind, it is a worry to me. In addition, so many times, as I sat trying to write I found the things that bother me the most encroached upon my mind. These worries moved stealthily to the forefront of my thoughts and for a while I felt that it didn’t make any difference what I wrote about, yet I questioned how I could integrate them into my journey to my Crepusculum. In the short time I have been posting, not all I write is directly related to my queries of the twilight, but I realize everything has the ability to influence my thinking and help me understand how I might react to problems during my time within my twilight. Any interaction I have is a permanent part of my experience and my experience will guide me down the path of exploration. But then, I wonder, what do you, the reader, think if I continually make detours to salve the mind and let my worries come into your lives. Will you see them as I do or do you expect much more consistency in presenting issues that I face in preparation for the next stage of my life? Now after five paragraphs do you question the validity of my not writing before now? I am sure it seems like writing to you, but to me it has only been a way that I can move from a state of blankness to a state of combining words…. a state slightly less than written text. Surprisingly now, I need to tell you more. I need to let you know how these past days have been so undirected. I am tired, very tired, but each day I know, I must go on. As I continue on each day (M. says I am not completely aware of what I do) I hope that I can continue giving my mother the same care as I have been, regardless that her care requirements have nearly tripled. I also wish that she is able to enjoy some form of happiness during this time and while these thoughts are active, I stop and remember all of you, as well as the other people who take the time to write me their well wishes. Then, without hesitation, I take a very long moment to send peace to Shadowlands as she watches over her husband, and I especially hope that her heart gently safeguards her through these trying days as her husband passes into the shadows of his darkness. Of us two, she is the stronger and I read in awe of how she continues each new day, rarely beleaguered before him, yet inwardly being overwhelmed and possibly alone. Therefore, he and my mother, as everyone does upon leaving their twilight, begin another journey, a final, unidirectional journey into a personal darkness. Some may say a light may guide you through that darkness, but even if it isn’t present often a living person can help by always being by their side. I know Shadowlands will walk with her husband every step of the way and I have promised my mother that I will be with her, regardless how long the journey may be. The promises, the care, the worries, the tiredness are all a part of my life now. Even though they may be problematic, it is my choice. These are easy for me, as compared to that final moment, the final good bye, that realization that I will never hear her speak, just as Shadowlands will never hear her husband’s voice again. Sure, the voice has been a part of my life; I can listen to it in my head at any time, but never again in the spontaneous conversation that has always been between us. Therefore, I think of a time during my mother’s last hospitalization that becomes very poignant. A respiratory therapist told me quite firmly that I need to grab a hold and deal with my mother’s death, She repeated this even louder and firmer as she left the room…………”Deal with it! NOW!” The words still echo in my head, but particularly that day left me speechless and almost childlike. Now, with time to do its work I can say I may need to “deal with it”, I have tried unsuccessfully for too many years and now I know that there is no way I will ever be prepared! Maybe now, once again I can write. I made it this far and my mind continues to be a tiny bit open. As I think on what I have written, it only reminds me how important it is for me to settle so much about my care when I reach that final journey, because I probably won’t have anyone I know to make sure everything will be as I want. I will be alone to walk through the darkness on a unidirectional journey.